The BMPT “Terminator” that was adopted by the Russian Army in 2017 has had a long history and a troubled development. Various incarnations of the vehicle were in development since the Soviet involvement in Afghanistan, and in some circumstances it was unsure what role the vehicle was even supposed to serve on the battlefield. However, a controversial interview with Aleksandr Yakovlev, one of the lead engineers of the current BMPT may shed some insight into the development process and how the BMPT might be used. In it he makes some dubious claims (The BMPT is superior to the T-14 Armata), but his personal involvement gives a general idea of how development might have proceeded. Like most other armored vehicles developed in Russia and the Soviet Union, the BMPT has an Object number. This is important as the “BMPT” concept has been around for a long time, with many vehicles bearing the name. 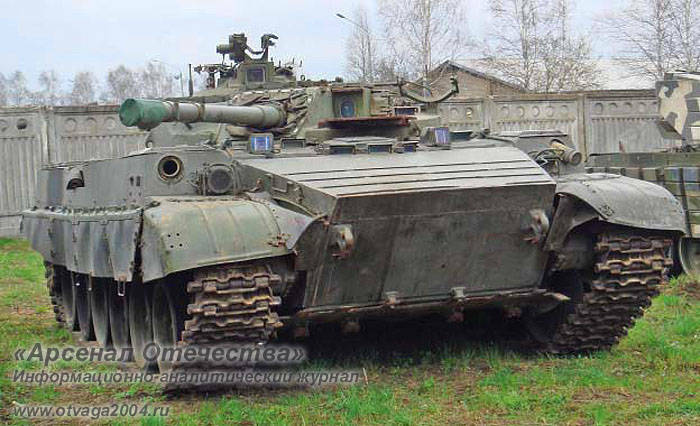 BMPT stands for Boyevaya Mashina Podderzhki Tankov or Tank Support Fighting Vehicle. The current BMPT is an evolution of the Object 199 aka “Ramka-99” prototype. Earlier BMPTs included the Object 781, which featured two turrets mounted on a tank chassis each with a 2A72 thirty-millimeter autocannon and machine gun in addition to two flexible grenade launcher mounts in the hull. An alternate configuration of the 781 featured the BMP-3 turret on the same chassis. What the earlier designs shared was a focus on close range fighting power, as the name might suggest. While the 2A70 low-pressure one-hundred-millimeter cannon on the single-turret cannon configuration of the Object 781 could fire ATGMs, it was not a primary focus of the BMPT design. BMPTs were envisioned to support tanks by providing firepower onto places conventional tank guns could not reach due to limits of gun elevation. Literature continually emphasizes the ability to hit the top floors of buildings and operate in mountainous terrain (indeed, before the BMPT designation prospective designs of the type were called “mountain tanks”). The BMPT in such a role needs only close range firepower as longer range capability would be provided by the conventional tanks with which it would be integrated. According to Yakovlev, this changed when BMPT design was restarted in the middle 1990s (likely due to the Chechen wars) and assigned to his design bureau in 1998. According to him, the primary focus of the design was to improve the survivability. His design was picked because of the very low profile turret allowing the design to fulfill the survivability requirements. But Yakovlev didn’t stop there. He replaced the Kornet ATGMs on the 199 paper design with Ataka-T ATGMs. This would allow the 199 to theoretically hit helicopters, as the Ataka is far faster than the Kornet and has a proximity fuse He also swapped out the 2A72 autocannons for the more accurate and flexible 2A42 cannons. At this time, Yakovlev said the aim of the Object 199 was to provide a “Long hand, sharp eye,” which hints at a focus on ranged combat and observational capability. The change in weaponry supported this. According to Yakovlev, a new sight and fire control system was devised to allow the Object 199 to engage three targets simultaneously with Atakas at distances of up to ten kilometers. Thus, the Object 199 became “a very expensive sniper rifle.” When asked why the military hadn’t adopted it yet, Yakovlev said that the military wanted him to make a simple hammer, but he made a microscope instead. After that point, Yakovlev makes a number of questionable claims regarding the Object 199, stating it would win against the Armata in a fight in an open field, that the military couldn’t destroy it in firing trials in 2007, and that it’s too survivable to be accepted into service. However his perspective on the Object 199’s design process in the 1990s explains why it took so long for the BMPT in its adopted incarnation took so long. The Russian military didn’t see a need for the extended suite of capabilities the “new” 199 provided until recently. The Russian engagement in Syria probably proved the need for a heavy ATGM platform that has good observational capabilities and might be able to take hits and be more survivable than existing MT-LB based ATGM platforms. In this regard, the BMPT is very flexible and can provide that capability in addition to the close range firepower it was originally designed to provide. How the BMPT will actually be integrated into Russian tank unit structures is still a mystery. One possibility is that they could be integrated into a fairly independent company size formation that’s built into Russian battalion tactical group. This would simplify maintenance, logistics, and training by keeping the BMPTs in one unit. The other option is that the BMPT could be integrated more deeply into tank formations, perhaps at the company level. This would allow the BMPTs to cooperate more closely with their formations, but could suffer from commanders not knowing how to properly employ the BMPT asset. Logistics wise, the BMPT should be fine in either role. The BMPT’s ammo and maintenance demands are already largely unified with the parent tank unit, given the shared chassis and the fact that Atakas and thirty-millimeter ammunition would already be in the supply system for the BMP-2s and Ataka MT-LB carriers of a unit. Kazakhstan provides a potential template for employing the BMPTs. During exercises they were attached to TOS-1A units and moved in after the TOS-1As fired an initial barrage to clear the area. As the TOS-1A, BMPT, and T-72 all share the same chassis and heavy armor, they can all maneuver as a unit.